We decided to all order a carvery, after all, it is what Toby does best so why order anything else. 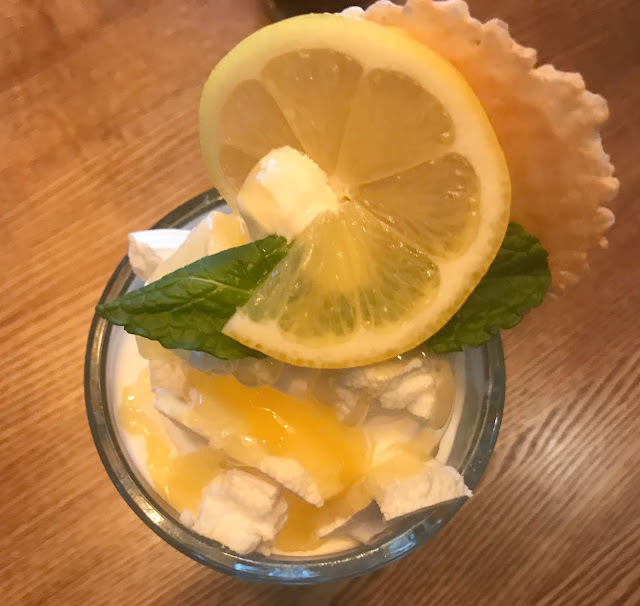 Myself, other half and teen ordered refillable soft drinks which we helped ourselves too and the little two had blackcurrant squash which was served at the table. 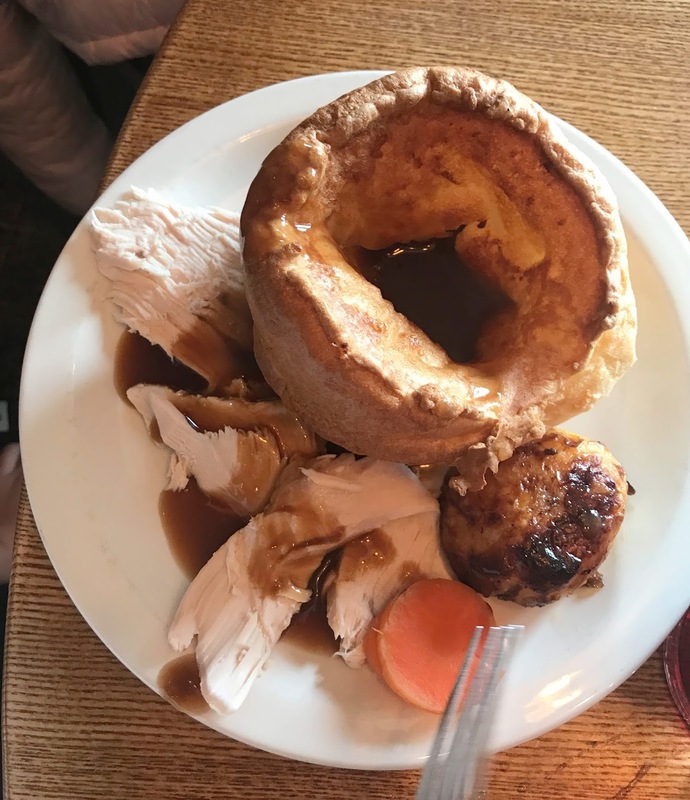 The thing I like the best about Toby Carvery is that they always have a choice of four roast meats, Turkey, Gammon, Pork and Beef and they always serve giant homemade Yorkshire puddings. Arriving at the carvery counter we had a bit of a wait as the chef had disappeared to get more meat (I think) and there was a bit of a queue in front of us. 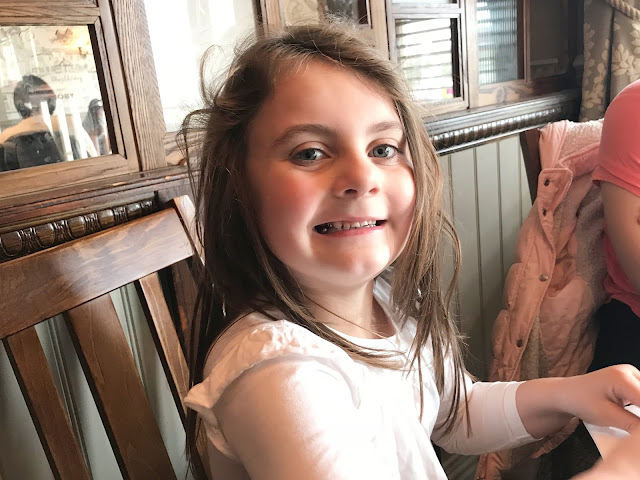 Now I honestly love Toby Carvery and we often pay to visit ourselves but I have to admit on this occasion I was a bit disappointed as the meat was really fatty, the beef and pork had huge chunks of fat on the top, so much so that the kids couldn't eat it. The mash had run out and no one had refilled it and the only vegetable dishes on offer was roast potatoes, a potato bake, onions, peas, carrots and cauliflower cheese and there is normally more choice. 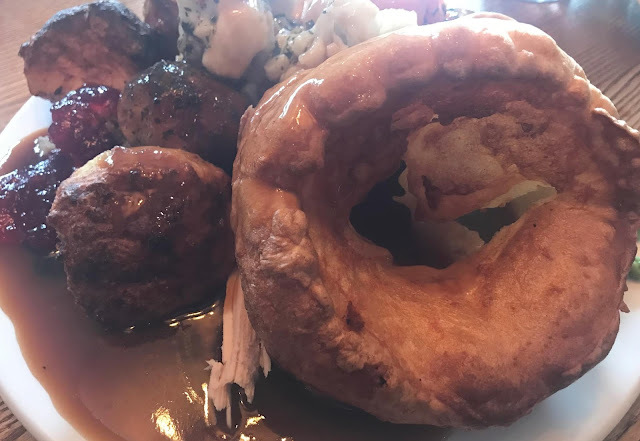 However the food that we did have was really nice, the roast potatoes were really crispy on the outside and fluffy in the middle, the turkey was really tasty and the Yorkshires were as nice as always. The service was also really good too, our server was really friendly with the children and the service was quick. 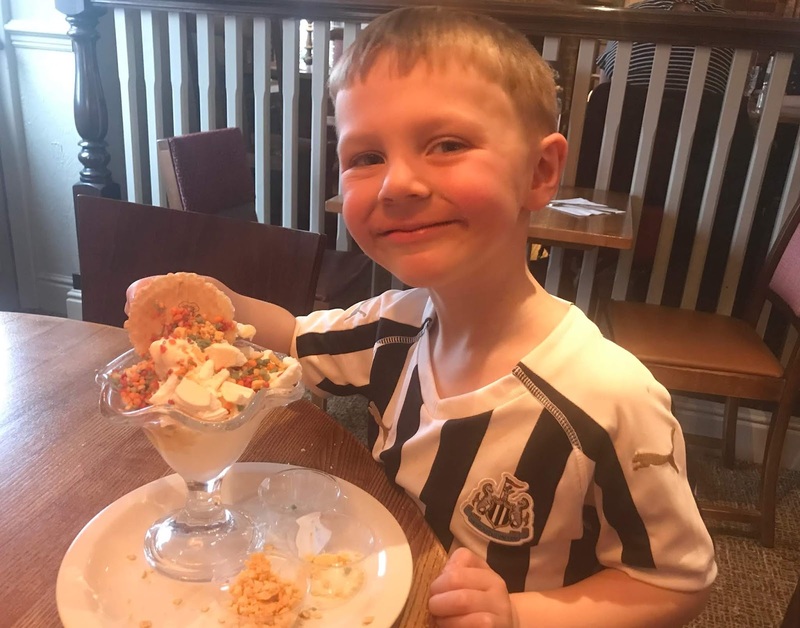 For dessert, the little two ordered the Make Your Own Sundae, dairy ice cream, meringue pieces, honeycomb pieces, fruit salad flavour crunch, a wafer and a choice of sauce; Jacob went for the Scillian Lemon sauce and Sophia had chocolate. Despite being a kids pudding, I thought they were really generous portions and the children really enjoyed them. 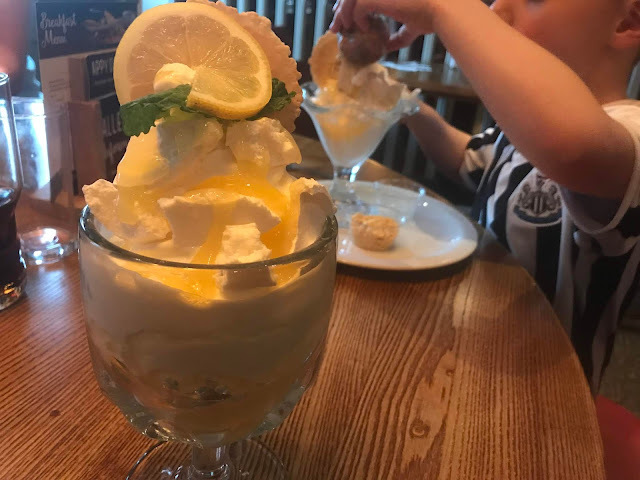 My teen ordered the apple, blackberry and redcurrant crumble served with custard and the other half went for the Scillian Lemon sundae. Desserts arrived promptly and were the perfect way to end our meal. We were in and out of the restaurant in just over an hour and a half it was fairly busy the whole time we were there. The service was really good, the restaurant and bar area looked really nice and clean and the toilets were also very clean. It was a shame that the food on the carvery was not topped up but the food that we did have was nice. Our bill for three adult carvery, two child carverys, two children sundaes, two adult puddings, three refillable drinks and two soft drinks was under £50 which I think is really good value. I am sure we will be revisiting Toby Carvery again soon, I just hope next time they have some mash. Disclosure We received a complimentary meal for the purpose of this review, all opinions are my own. I have actually never been to a Toby Carvery, I have passed one a couple of times and never been in. The yorkshires look fab but it was a shame the meat was a bit of a let down. Thanks for an honest review. I have never visited a Toby carvery so I was interested to read what you thought of it. The price seems reasonable. I haven't been to a Toby Carvery in years. Those Yorkshires look amazing! Just a shame that other parts of the meal weren't quite up to scratch. Hopefully they'll get it 100% right next time you visit! I love visiting our local Toby Carvery........even my non-roast loving son loves it as he gets to eat Gammon and "orkshire puddings"
I really like a Toby carvery and as long as the roast potatoes are cooked to perfection then I am happy! I like your review here. The food looks very tasty.